Enter PIN, then click to validate. Required to connect your loved one's fingerprint image to your product order. Traditional monograms have the Last Initial in the center, as shown in the example below for Jack Edward Thompson (JTE). Back Inscription (Line 1) - up to 24 characters. Back Inscription (Line 2) - up to 24 characters. Back Inscription (Line 3) - up to 24 characters. Back Inscription (Line 4) - up to 24 characters. Inscription Confirmation*: I confirm the inscription indicated above is correct (or, by choosing None, I wish NOT to have an inscription). This keepsake can also accommodate an infant hand or foot print. 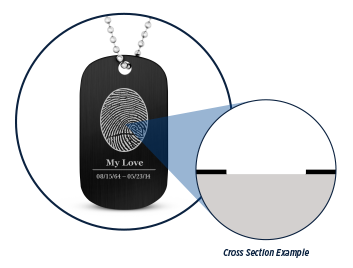 Etched products like our Ultralight Aluminum Dog Tag use a delicate technique that removes only the surface coating, exposing the base metal underneath and creating a beautiful and contrasting fingerprint image. 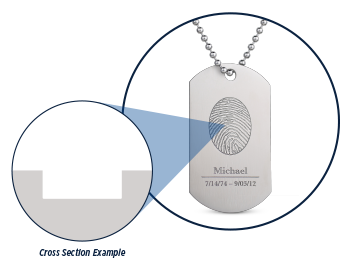 With all of our gold and silver keepsakes, and many of our other items including the Stainless Steel Military Dog Tag, the fingerprint is deeply engraved into the product. You can feel the grooves of the fingerprint, providing a feeling of connection and comfort. With Legacy Touch's unique Express Production Service, families that order selected keepsakes before 12:00pm (noon) Central Time Mon-Fri can have their items carefully personalized and produced the same day and then shipped overnight for delivery on the next business day to U.S. addresses (1-3 business days to Canada). Why do we offer this exceptional service? Because it allows these keepsakes to be worn or given as gifts at funerals and visitations. Many families find this touching addition to their ceremonies extraordinarily comforting. An Express Production charge of just $20.00 per keepsake will apply. For a guaranteed delivery date without the urgency of overnight, Legacy Touch's Accelerated Production Service is the perfect fit. When ordered before 12:00pm (noon) Central Time Mon-Fri, eligible keepsakes will deliver in 3 business days when shipped to a U.S. address (3-5 business days to Canada). An Accelerated Production charge of just $10.00 per keepsake will apply. For orders that are not time-critical, Legacy Touch still leads the industry with our Standard Production service which, for this item, delivers in approximately one week at no additional charge (a few of our items do require a little more time). For more information on delivery timeframes and available production levels, please click here. I was very happy with the dog tag and chain I ordered. It was exactly what I wanted to remember my son. It’s a very beautiful piece of jewelry that I wear every day to remind me of him. I love that I’ll always have his finger print close to my heart. Thank you so much. It was very easy to order the dog tag finger print of my dad and I received it very quickly. I ordered two dog tags one to hang in my vehicle the other was for a memorial. They are very nice. I gave this the my son for his birthday and he will always have his grandfather close to his heart. THANKS! I ordered an item with my moms fingerprint and received my order the next day. What this company does to allow us to keep our loved one we lost close to us is amazing. When my dog tag arrived it was exactly what I ordered and even better. Thank you for giving me a little part of my mom to keep close to me forever.